What was on the minds and social media feeds of our favorite celebrity moms this week? Beyoncé shares a sweet photo of Blue Ivy with her Aunt Solange on her wedding day, as well as more intimate wedding photos. Katherine Heigl posts a sweet photo with her kids, while LeAnn Rimes is getting in the Christmas spirit with her stepsons. Poppy Montgomery (with her new baby Gus) and Gwen Stefani round out our list of the most buzz-worthy celebrity moms on social media. 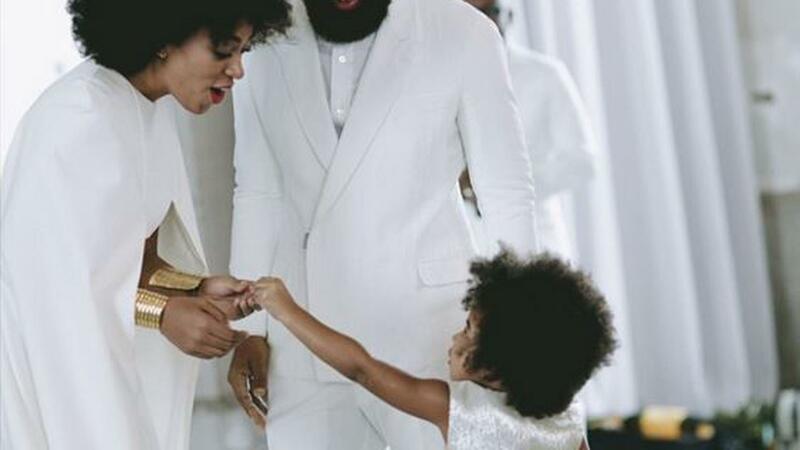 Beyoncé shared this sweet snapshot on her Instagram page as her daughter, Blue Ivy, holds her aunt’s hand on Solange’s wedding day. Solange, 28, married Alan Ferguson, 51, in New Orleans over the weekend. Perhaps 2-year-old Blue Ivy, who looked cute in a shimmery white dress, was Solange’s “something blue”? The bride looked gorgeous in a white Humberto Leon for Kenzo gown, which included a white cape and was accessorized with a gold cuff. Beyoncé shared several snapshots of the wedding, such as this picture of the wedding party including Beyoncé and their mother Tina Knowles, all in white dresses. It wasn’t just the women who wore white, as Beyoncé posted this shot of the groom Alan along with Solange’s 10-year-old son Daniel from a previous marriage, as well as Jay Z. I guess this means that Solange and Jay Z put the elevator fight behind them? Solange also tweeted about the picture circulating which showed her with hives on her face on the day of her wedding, giving a “shout out to Benadryl.” She blames the hives on overheating from getting her groove on dancing. Actress Katherine Heigl squeezed in some time with her two daughters, 5-year-old Naleigh and 2-year-old Adalaide, while on set of her new NBC show, State of Affairs. “So fun to have my munchkins running around our Langley set,” she captioned the cute photo. LeAnn Rimes and Eddie Cibrian are getting in the Christmas spirit. The singer posted this photo as she poses with her husband and stepsons, 11-year-old Mason and 7-year-old Jake. The boys are the sons of Cibrian’s ex-wife, The Real Housewives of Beverly Hills star Brandi Glanville. Unforgettable actress Poppy Montgomery shared this sweet snapshot as she cuddles next to her newborn son, Gus Monroe Deveraux Sanford. The 42-year-old actress also has a 19-month-old daughter, Violet, and a 6-year-old son, Jackson. Adorable photo alert. Gwen Stefani shared this photo of her 8-month-old son Apollo while on set for The Voice. Holding on to one of her bracelets, Apollo smiles sweetly in the camera as he shows off his rocker style in a black leather jacket. How much weight has pregnant Hayden Panettiere gained?